Successfully Added HK Warehouse HOMTOM HT17 Pro Smartphone - Quad Core CPU, 2GB RAM, 4G, 5.5 Inch HD Display, OTG, HotKnot, Firgerprint (Blue) to your Shopping Cart. The HOMTOM HT17 Pro is a thin new phablet that boast a bundle of top features at an affordable price. Including a 5.5 inch screen, Android 6.0 OS, Quad Core GPU, 2GB RAM, Fingerprint scanner, 4G, OTG and HotKnot it really does deliver great value for money. At just 7.9mm thin this large screen phone is fairly impressive and is a comfortable size for your hand and pockets. That expansive 5.5 inch HD screen is super for watching videos. With its quad core CPU, 2GB RAM and Mali-T720 GPU the HOMTOM HT17 Pro gets an admirable score on benchmark tests and is more than powerful enough for some serious gaming fun as well. This mid range MTK chipset, Android 6.0 OS and HD screen strikes a perfect balance between performance and usage time allowing you to do everything you need while remaining operational for much longer, consequently you ca expect some serious operational timt from the phones 3000mAh battery. When it comes to connectivity this Phablet has two SIM card Slots, can support 4G networks, tkes advantage of Bluetooth 4.0 and brings easy file and data transfer with either OTG or wirelessly through HotKnot. Which is a nice touch for a budget phone. Android 6.0 delivers a well balanced performance and offers all the shortcuts and management you need while Google play offers up loads of additional apps and games so you can max out on productivity and fun. With 16GB of built in memory and 64GB additional storage available through the micro SD card slot there is no shortage of space. 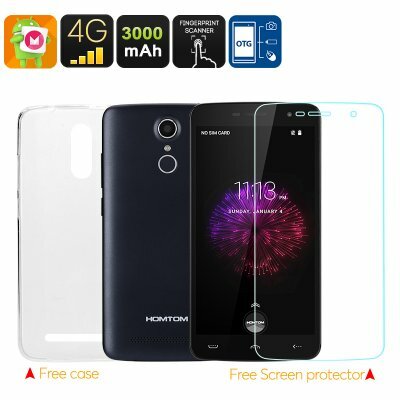 The HOMTOM HT17 Pro Large Screen Smartphone comes with a 12 months warranty, brought to you by the leader in electronic devices as well as wholesale Android Phones..